The bicentenary of this occasion was celebrated with a new production of the same work and Opera Rara went to Trieste to record the initial performances of this important revival. The cast is led by French soprano Elizabeth Vidal who tackles the stratospheric role of Ginevra with ease (and Es – a bushel of them!!). As the hero Ariodante, Daniela Barcellona confirms her place on the roster of talented, young artists emerging from Italy. Antonino Siragusa, likewise, is representative of the new generation of bel canto tenors. 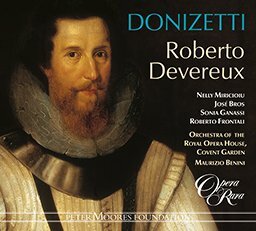 Giovanni Simone Mayr is remembered today as the teacher of Donizetti. Born in Bavaria, he came to Italy at the end of the 18th century and became one of the most respected composers in the country. His operas were performed at the best theatres and with the best casts. What is it about Mayr that is so interesting? First of all, he is said to be the missing link in opera – that composer who completes the connection from Mozart to Rossini. The Teatro Nuovo in Trieste opened on April 21, 1801, with the first performance of Mayr’s opera. 04 Ginevra di Scozia: Act I scena I: Coro e Scena: S’apra alla gioja – scena II: Ah, padre! 09 Ginevra di Scozia: Act I scena IV: Recitative: Dalinda! ? Mio Signor! ? – scena V: Che pensa ei mai? 20 Ginevra di Scozia: Act I scena IX: Recitative: Oh Dio! Qual gel mi scende al cor! ? 23 Ginevra di Scozia: Act I scena IX: Tempo primo: Ma verrai? 27 Ginevra di Scozia: Act I scena XIII: Allegro: Che vidi! Oh Dio! ? 31 Ginevra di Scozia: Act I scena XVI: Finale Primo: Sgombra, o Ciel! Dal mio seno – scena XVII: Che avvenne? ? 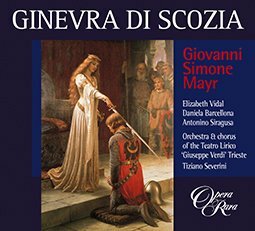 34 Ginevra di Scozia: Act I scena XVI: Tempo primo: Ma voi tutti, ohime! 35 Ginevra di Scozia: Act II scena I: Recitative: Oh me dolente! Ahi! Lasso! – scena II: Pieta ? la vita ? 37 Ginevra di Scozia: Act II scena III: Scena dei Solitari: Ove son io? ? 39 Ginevra di Scozia: Act II scena IV: Coro di Solitari: Quale orror! Che infausto di! 40 Ginevra di Scozia: Act II scena IV: Recitative: Qual sciagura mai! 41 Ginevra di Scozia: Act II scena IV: Allegro: Non perira! 44 Ginevra di Scozia: Act II scena IV: Scena: Ma ? s’e rea! 46 Ginevra di Scozia: Act II scena V: Recitative: La legge eseguiro. 47 Ginevra di Scozia: Act II scena VI: Aria: Tu mi traffigi, ingrato! 49 Ginevra di Scozia: Act II scena VII: Scena: Infelice Ginevra! ? 51 Ginevra di Scozia: Act II scena VII: Allegro: Ah! Sarai paga, avversa sorte! – scena VIII: Crudo cimento! 54 Ginevra di Scozia: Act II scena IX: Allegro: Dunque nel campo scendi? 55 Ginevra di Scozia: Act II scena X: Recitative: Figlia! Padre! 56 Ginevra di Scozia: Act II scena XI: Quintetto: Io la difendo. 57 Ginevra di Scozia: Act II scena XI: Recitative: Guerrier, chi sei? 58 Ginevra di Scozia: Act II scena XII: Recitative: Orrible momento! 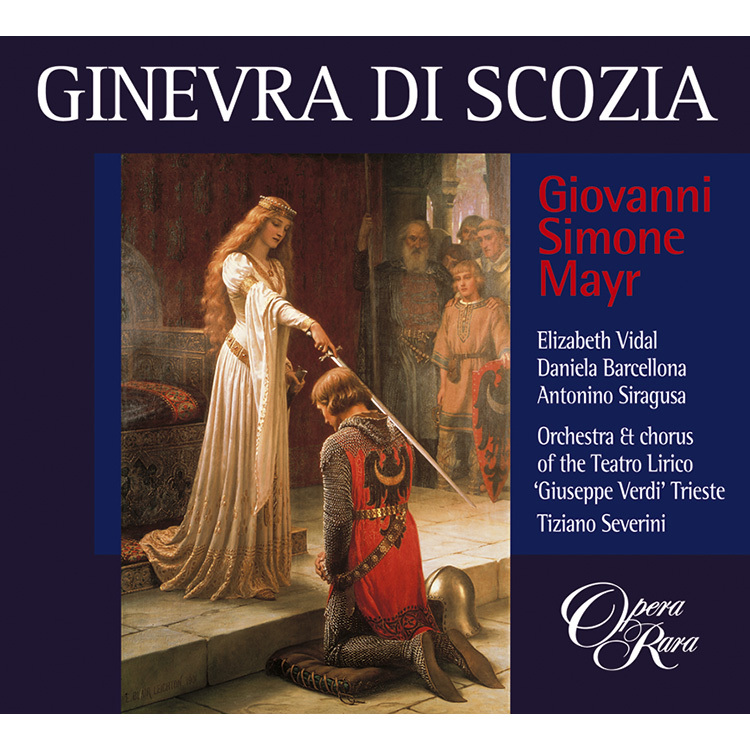 59 Ginevra di Scozia: Act II scena XII: Recitative: Che dici tu? ? 60 Ginevra di Scozia: Act II scena XII: Duet: Per pieta, deh! 62 Ginevra di Scozia: Act II scena XII: Tempo primo: Ah! Si vada ? 63 Ginevra di Scozia: Act II scena XIII: Coro: Oh giorno di spavento! 64 Ginevra di Scozia: Act II scena XIII: Recitative: Popoli! Al gran cimento ecco la figlia – scena XIV: Fermatevi, Guerrieri. 66 Ginevra di Scozia: Act II scena XIV: Scozzese: Oh! Giocondo, e lieto giorno! The opera is set in St Andrews in Scotland in legendary times. Scene 1. The King of Scotland and his courtiers pray to Heaven for aid, since at this very moment, outside the walls of the city, their army is engaged in battle with invaders from Ireland. To their relief an Italian knight, Lurcanio, brings news that his brother Ariodante, who has been away raising extra forces in England, has returned just in time. Arrived on the field of battle, he has succeeded in turning the tide in Scotland’s favour. Apprehension gives way to celebration as all speed Lurcanio on his way to share in Ariodante’s victory. The King shares the good news with his daughter, Ginevra, and bids her prepare a garland for the victor’s brow – an order that she willingly receives, since she is deeply in love with Ariodante. Dalinda, her waiting-woman, tries to caution her, suggesting that her father will never allow her to marry a foreign knight with no connections. Dalinda recommends, instead, that she should accept the suit of Polinesso, Duke of Albany, the High Constable of Scotland, but Ginevra declares that she dislikes Polinesso just as much as she loves Ariodante. Such a reaction can scarcely be unwelcome to Dalinda, for she herself is in love with Polinesso, and has made her suggestions only at his bidding. Scene 2. Dalinda, meeting with Polinesso in the palace gardens, delivers her report. Polinesso, who is motivated by pride, by insatiable desire for Ginevra and by hatred for Ariodante, receives the news of his rejection with inner rage but outward calm. He pretends to wish to renew his previous liaison with Dalinda, and tells her that he will keep tryst with her that evening. She must let a rope ladder down from Ginevra’s balcony so that he may ascend to her embraces. More surprisingly, he tells her that she must wear clothes similar to Ginevra’s, and arrange her hair in Ginevra’s manner. Though mystified at such a ‘mad whim’, Dalinda agrees. Scene 3. The King and his courtiers gather to celebrate Ariodante’s victory. Ariodante enters in triumph, kneels before the King and lays the spoils of battle at his feet. Ginevra crowns him with laurel. Polinesso, watching, is consumed by jealousy. Lurcanio reproaches Dalinda with failing to return his love, but she replies that her affections were already committed before ever he arrived in Scotland. She refuses to reveal the name of his successful rival. Scene 4. Polinesso waylays Ariodante in the palace gardens, and taunts him with suggestions that Ginevra is playing him false. He eventually claims that he himself is Ginevra’s lover, and suggests that, if Ariodante wishes to gain proof of the fact, he should watch beneath her balcony that evening. Incredulous and indignant, Ariodante can only agree to do so, adding that if what Polinesso insinuates is true, Ginevra will be his. Scene 5. A partly ruined area of the city overlooked by Ginevra’s apartments, with a bridge over a river in the background. Ariodante, keeping his appointment, is joined by his brother Lurcanio; they conceal themselves in ruined vaults as Polinesso arrives, aware of Ariodante’s presence and gloating to think of his approaching discomfiture. Dalinda duly appears, and lowers the ladder by which Polinesso ascends. Ariodante and Lurcanio are both convinced that they have seen Ginevra receiving her lover. Ariodante tries to stab himself, but is disarmed by Lurcanio. Thwarted, he races on to the bridge in the background and throws himself into the river. 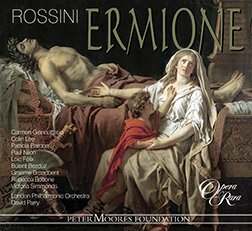 Lurcanio’s distraught cries soon bring people running – and eventually a hypocritical Polinesso, who pretends to interpret the gathering as a riot threatening the life of the King. When the circumstances of Ariodante’s suicide are explained to him, he offers to lead the crowd to the King, with the intention that whoever has been guilty of betraying Ariodante, and thus bringing about his death, may be brought to justice. Scene 6. Polinesso and Lurcanio lead the populace into the King’s presence, and Lurcanio duly denounces Ginevra and demands her death. The King, appalled to find his own daughter the subject of such an accusation, is faced with having to enforce an ancient law whereby a woman who is proved unchaste is condemned to death by burning at the stake. Scene 1. Vafrino, Ariodante’s squire, wanders disconsolate upon the shore, unable to find his master’s body. He hears the cries of a woman in distress, and succeeds in rescuing Dalinda from the threats of two would-be assassins. She tells him that she is the victim of the cruellest deception, and promises to tell him all. Scene 2. A dense wood surrounding the temple or church of a band of hermits. Ariodante, who has escaped death, makes his appearance in a state of black despondency. His thoughts are interrupted by the appearance of the hermits, who inform him that Ginevra has been condemned to death, and will die that very day unless a champion appear to defend her. Although convinced of her guilt, Ariodante still loves her so deeply that he determines to go to her defence. The hermits applaud his purpose, and urge him to make haste. Scene 3. A disconsolate King laments the approaching loss of his daughter, and reproaches Lurcanio for the manner in which he repays his kindnesses to him. Lurcanio replies that his primary duty is to avenge his brother. Scene 4. Ginevra assures her father that she is not afraid to die, for death will reunite her with her beloved Ariodante. She does, however, deplore and fear the infamy that will attach to her name if she is publicly burned at the stake, and begs to be given a sword or a draught of poison so that she can die a more private and becoming death. The King is deeply disturbed, but does not commit himself either way. Scene 5. As the sun sinks, Polinesso appears, secretly rejoicing at the part he is about to play as master of ceremonies at Ginevra’s burning, but pretending to commiserate with the King in his grief. When asked if he will defend Ginevra, he predictably declines, declaring his conviction that the law must take its course. Lurcanio urges that Ginevra’s punishment proceed, but at this moment a knight in black armour appears, his vizor lowered. Declaring that he comes as Ginevra’s champion, he throws down his gauntlet, and Lurcanio, as Ginevra’s accuser, gathers it up. Despite Ginevra’s pleas to know his identity, the unknown knight declares that he will reveal himself only after the combat. In accordance with custom, he is left alone with Ginevra until the moment of combat. Ginevra expresses her gratitude to him, but sues to be released from any obligation to be his, should he prove the victor, since she assures him that she can never love anyone except the Ariodante she has lost. He, for his part, declares his readiness to die for her, but admits that he has no hope of victory, since ‘only he who defends the right shall conquer’. Ginevra assures him that he does defend the right, and insists that she is innocent. Impressed by her steadfastness and moved by her pleas, the knight is about to reveal himself when the sound of trumpets calls him to the combat. He departs in haste. Scene 6. The great square of the city, with a palisaded area for the combat and, to one side, a funeral pyre. Ginevra arms her knight, and he and Lurcanio enter the combat area. But before they can come to blows, Vafrino and Dalinda enter, and the latter confesses how she allowed herself to be seduced, and how, in return, Polinesso delivered her up to two of his servants to be slain. Polinesso denies her tale, and vaunts his readiness to defend his good name against all comers. The unknown knight responds – he and Polinesso fight – and Polinesso is disarmed. Faced with the choice of confession or death, he makes a full and remorseful acknowledgment of his guilt. Ginevra, her innocence now manifest to all, embraces her father. She asks permission to end her days in some solitary retreat where she can mourn her Ariodante, but at this point the unknown knight raises his vizor and, to the surprise and joy of all, reveals himself as Ariodante. He and Ginevra are united, and the opera ends in rejoicing and celebration. 1. Szene Der König von Schottland und seine Höflinge flehen den Himmel um Beistand an, während ihr Heer vor den Stadtmauern gegen irische Eindringlinge kämpft. Zu ihrer Erleichterung kommt Lurcanio, ein italienischer Ritter, mit der Nachricht, dass sein Bruder Ariodante, der vor kurzem mit neu angeworbenen Soldaten aus England zurückgekehrt ist die Schlacht gerade noch rechtzeitig zu Gunsten Schottlands wenden konnte. Die Angst geht in Siegesstimmung über, alle Anwesenden schicken Lurcanio eilends hinfort, um an Ariodantes Sieg teilzuhaben. Der König überbringt seiner Tochter Ginevra die gute Nachricht und trägt ihr auf, dem Sieger einen Kranz zu winden. Dies tut sie umso lieber, als sie in tiefer Liebe zu Ariodante entbrannt ist. Ihre Zofe Dalinda mahnt sie zu Vorsicht und warnt sie, ihr Vater werde ihr nie erlauben, sich einem fremden, fahrenden Ritter zu vermählen; lieber solle sie dem Antrag von Polinesso, Herzog von Albany und Verweser von Schottland, stattgeben. Doch Ginevra, die Polinesso, wie sie erklärt, mit derselben Inbrunst verabscheut, mit der sie Ariodante liebt, weist ein solches Ansinnen weit von sich. Diese Reaktion kommt Dalinda mehr als gelegen, da sie selbst in Polinesso verliebt ist und den Vorschlag nur auf dessen Drängen hin geäußert hat. 2. Szene Dalinda trifft sich mit Polinesso in den Palastgärten, um ihm Bericht zu erstatten. Der stolze Polinesso, der getrieben ist von Verlangen nach Ginevra und Hass auf Ariodante, nimmt die Nachricht seiner Zurückweisung äußerlich gelassen auf, innerlich jedoch kocht er vor Zorn. Unter dem Vorwand, seine frühere Liebelei mit Dalinda wiederaufnehmen zu wollen, vereinbart er für den Abend ein Stelldichein mit ihr. Sie müsse ihm, so trägt er ihr auf, eine Strickleiter von Ginevras Altan herablassen, so dass er zu ihr hinaufsteigen und sie umarmen könne. Noch überraschender ist sein Wunsch, sie solle ähnliche Kleidung und eine ähnliche Haartracht wie Ginevra tragen. Dalinda ist zwar verwundert über diese „Grillen“, willigt aber ein. 3. Szene Der König und seine Höflinge versammeln sich, um Ariodantes Sieg zu feiern. Im Triumph tritt er ein, kniet vor dem König nieder und breitet die Beute vor seinen Füßen aus, während Ginevra ihn mit einem Lorbeerkranz krönt. Polinesso beobachtet dies alles voller Eifersucht. Als Lurcanio Dalinda vorwurfsvoll fragt, warum sie seine Liebe nicht erwidere, antwortet sie, dass sie ihr Herz bereits lang vor seiner Ankunft in Schottland verschenkt habe, weigert sich aber, den Namen seines Rivalen preiszugeben. 4. Szene Polinesso fängt Ariodante im Palastgarten ab und reizt ihn mit Anspielungen, dass Ginevra ihn hintergehe. Schließlich behauptet er, dass er selbst Ginevras Geliebter sei, und erklärt Ariodante, wenn dieser Beweise dafür sehen wolle, müsse er sich am selben Abend unter deren Balkon einfinden. Ungläubig und empört willigt Ariodante ein und verkündet, wenn Polinessos Behauptungen tatsächlich stimmten, gehöre Ginevra ihm. 5. Szene Verfallene Bauten unterhalb von Ginevras Gemächern, im Hintergrund ein Fluss, über den sich eine Brücke spannt. Ariodante findet sich bei den Ruinen ein, dann gesellt sich sein Bruder Lurcanio zu ihm. Gemeinsam verbergen sie sich in den Gewölben, während Polinesso – wissend um Ariodantes Gegenwart – eintrifft, frohlockend angesichts der Überraschung, die diesen erwartet. Dalinda tritt auf den Altan und lässt die Leiter herab, über die Polinesso zu ihr hinaufsteigt. Ariodante und Lurcanio sind überzeugt, dass es Ginevra ist, die den Herzog als ihren Geliebten empfängt. Ariodante will sich in sein Messer stürzen, doch Lurcanio entwindet es ihm. Verzweifelt läuft Ariodante zur Brücke und stürzt sich in die Fluten. Auf Lurcanios verzweifeltes Rufen hin eilen Menschen herbei, darunter auch Polinesso, der die Ansammlung scheinheilig als gegen den König gerichteten Aufstand deutet. Als ihm die Umstände von Ariodantes Selbstmord erläutert werden, erbietet er sich, die Menge zum König zu führen; dieser möge denjenigen, der Ariodante verriet und ihn damit in den Selbstmord trieb, seiner gerechten Strafe zuführen. 6. Szene Polinesso und Lurcanio treten mit dem Volk vor den König: Lurcanio erhebt Anklage gegen Ginevra und verlangt ihren Tod. Der König ist entsetzt über den Gedanken, seine eigene Tochter könne eines solchen Vergehens schuldig sein, sieht sich aber gezwungen, ein uraltes Gesetz anzuwenden, nach dem eine Frau, die der Unkeuschheit überführt ist, zum Tod auf dem Scheiterhaufen verurteilt wird. 1. Szene Vafrino, Ariodantes Schildknappe, wandert untröstlich am Flussufer entlang, weil er die Leiche seines Herrn nicht finden kann. Da hört er die verzweifelten Schreie einer Frau und kann gerade noch verhindern, dass Dalinda von zwei Meuchelmördern umgebracht wird. Die Gerettete erzählt ihm, dass sie das Opfer eines grausamen Verrats geworden ist, und verspricht, die ganze Geschichte darzulegen. 2. Szene Ein dichter Wald um das Heiligtum einer Einsiedelei. Ariodante, der dem Tod entronnen ist, tritt in düsterster Gemütsverfassung auf. Sein Sinnieren wird unterbrochen durch das Auftreten der Einsiedler, die ihm mitteilen, dass Ginevra zum Tode verurteilt ist und noch am selben Tag sterben soll, wenn nicht ein Ritter sie im Turnier verteidigt. Ariodante ist zwar von ihrer Schuld überzeugt, liebt sie aber noch immer so sehr, dass er beschließt, für sie anzutreten. Die Einsiedlern begrüßen seine Entscheidung und schicken ihn eilig auf den Weg. 3. Szene Der König betrauert den bevorstehenden Tod seiner Tochter und macht Lurcanio Vorhaltungen wegen der Art, in der dieser ihm seine Güte danke. Doch Lurcanio erwidert, seine Pflicht bestehe vor allem darin, seinen Bruder zu rächen. 4. Szene Ginevra versichert ihrem Vater, dass sie keine Angst habe zu sterben, da der Tod sie mit ihrem geliebten Ariodante wiedervereinen werde. Was sie jedoch bekümmere, sei die Schmach, die an ihrem Namen haften werde, wenn sie öffentlich auf dem Scheiterhaufen verbrannt werde. Deswegen fleht sie ihn an, er möge ihr ein Schwert oder Gift geben, damit sie in Würde sterben könne. Der König, zutiefst bekümmert, vermag keine Entscheidung zu treffen. 5. Szene Sonnenuntergang; Polinesso tritt auf. Insgeheim freut er sich auf die Rolle, die er als Zeremonienmeister bei Ginevras Hinrichtung spielen soll, heuchelt dem König aber Mitgefühl für dessen Trauer vor. Auf die Frage, ob er für Ginevra kämpfen wolle, lehnt er ab und erklärt, das Gesetz müsse seinen Lauf nehmen. Lurcanio drängt, mit Ginevras Hinrichtung zu beginnen, doch just in dem Augenblick erscheint ein Ritter in schwarzer Rüstung, das Visier geschlossen. Er verkündet, er komme als Ginevras Kämpe, und wirft den Fehdehandschuh nieder, den Lurcanio als Ankläger Ginevras aufnimmt. Trotz Ginevras Bitten, er möge sich zu erkennen geben, erklärt der namenlose Ritter, er werde das Visier erst nach dem Turnier heben. Nach alter Sitte wird er bis zum Beginn des Turniers mit Ginevra allein gelassen. Ginevra spricht ihm ihren Dank aus, bittet ihn aber, sie – im Falle seines Sieges – von jeder Verpflichtung zu entbinden, da sie nie einen anderen Mann lieben könne als den verlorenen Ariodante. Er seinerseits erklärt, er sei zwar bereit, für sie zu sterben, habe aber keinerlei Hoffnung zu siegen, da nur derjenige gewinne, der die Aufrechten verteidige. Ginevra versichert, dass er in der Tat eine Aufrichtige verteidige, und beteuert ihre Unschuld. Beeindruckt von ihrer Standhaftigkeit und bewegt von ihrem Flehen, will sich der Ritter gerade zu erkennen geben, als die Fanfaren ihn zum Turnier rufen. Eilig geht er ab. 6. Szene Der große Marktplatz mit dem umzäunten Turnierplatz, gegenüber der Scheiterhaufen. Ginevra rüstet ihren Kämpen, der ebenso wie Lurcanio den Turnierplatz betritt. Doch noch ehe sie die Waffen heben können, treten Vafrino und Dalinda ein. Die Zofe gesteht, wie sie sich verführen ließ und Polinesso sie daraufhin von zwei seiner Pagen töten lassen wollte. Polinesso streitet ihre Beschuldigung ab und erklärt sich bereit, seinen guten Namen gegen jeden Ehrenmann zu verteidigen. Der namenlose Ritter meldet sich, die beiden kämpfen miteinander, und Polinesso wird besiegt. Vor die Wahl gestellt, ein Geständnis abzulegen oder zu sterben, gesteht Polinesso reumütig seine Schuld. Ginevra, deren Unschuld nun erwiesen ist, umarmt ihren Vater. Sie bittet ihn um Erlaubnis, den Rest ihrer Tage in Einsamkeit verbringen und um ihren Ariodante trauern zu dürfen, doch da hebt der namenlose Ritter sein Visier und gibt sich zur Überraschung und Freude aller als Ariodante zu erkennen. Er und Ginevra sind vereint, die Oper endet mit einer ausgelassenen Feier. Scena 1 Il re di Scozia e la sua corte invocano l’aiuto divino: le mura della città sono circondate e il loro esercito è impegnato a combattere alcuni invasori provenienti dall’Irlanda. Grande sollievo porta l’ingresso del cavaliere italiano, Lurcanio, latore di una buona notizia: suo fratello Ariodante, partito alla volta dell’Inghilterra per radunare un contingente di rinforzo, ha fatto ritorno appena in tempo. Giunto sul campo di battaglia, è riuscito a rovesciare le sorti del conflitto a favore della Scozia. Il timore lascia il posto ai festeggiamenti e Lurcanio viene inviato a condividere la vittoria di Ariodante. Il re comunica la buona notizia a sua figlia Ginevra e le chiede di preparare una ghirlanda per incoronare il vincitore; la donna, profondamente innamorata di Ariodante, accetta di buon grado l’ordine. La sua ancella personale, Dalinda, cerca di avvertirla che il padre non le permetterà mai di sposare un cavaliere straniero senza famiglia e le consiglia invece di accettare l’offerta di Polinesso, duca di Albany, alto Conestabile di Scozia. Ginevra dichiara di detestare Polinesso tanto quanto ama Ariodante. Una reazione del genere può solo far piacere a Dalinda, che è a sua volta innamorata di Polinesso, e ha avanzato il suggerimento solo dietro sua richiesta. Scena 2. Durante un incontro con Polinesso nel giardino della reggia, Dalinda gli riferisce l’accaduto. Divorato dall’orgoglio, da un desiderio insaziabile di Ginevra e dall’odio per Ariodante, Polinesso accoglie con apparente calma, ma con profonda ira, la notizia del rifiuto. Fingendo di voler riprendere la sua passata relazione con Dalinda, le dà convegno per quella sera stessa. Dalinda dovrà calare una scala di corde dal balcone di Ginevra per consentirgli di salire e unirsi a lei; inoltre dovrà indossare abiti simili a quelli di Ginevra e pettinarsi come lei. Per quanto questo folle desiderio la lasci perplessa, la donna accetta. Scena 3. Il Re riunisce la corte per festeggiare la vittoria di Ariodante, che entra in trionfo, si inginocchia davanti al Re e depone il bottino di guerra ai suoi piedi. Ginevra lo incorona di alloro. Polinesso osserva, consumato dalla gelosia. Lurcanio rimprovera Dalinda di non ricambiare il suo amore, ma la donna risponde che il proprio cuore era già impegnato prima del suo arrivo in Scozia e rifiuta di rivelare il nome del fortunato rivale. Scena 4. Polinesso intercetta Ariodante nel giardino della reggia e lo provoca con allusioni alla presunta infedeltà di Ginevra. Infine dichiara di essere egli stesso l’amante di Ginevra e insinua che, se Ariodante desidera avere una prova del fatto, dovrà appostarsi sotto il suo balcone quella sera. Incredulo e sdegnato, Ariodante non ha scelta, ma aggiunge che se l’insinuazione di Polinesso è vera, Ginevra sarà sua. Scena 5. Una zona della città con alcune rovine, dominate dagli appartamenti di Ginevra; in fondo si vede un ponte su un fiume. Ariodante, puntuale all’appuntamento, è accompagnato dal fratello Lurcanio; i due si nascondono tra alcuni ruderi mentre arriva Polinesso, consapevole della presenza di Ariodante e gongolante al pensiero della sua prossima sconfitta. Dalinda compare puntualmente e cala le corde che Polinesso usa per salire. Ariodante e Lurcanio si convincono di aver assistito a un convegno tra Ginevra e il suo amante. Ariodante tenta di pugnalarsi, ma viene disarmato da Lurcanio, che tenta inutilmente di ostacolarlo; infine si precipita sul ponte in lontananza e si getta nel fiume. Alle disperate grida di Lurcanio ben presto accorrono diverse persone e alla fine anche Polinesso, che ipocritamente finge di interpretare il raduno come una rivolta per attentare alla vita del Re. Quando gli vengono spiegate le circostanze del suicidio di Ariodante, si offre di condurre la folla fino al Re, per consegnare alla giustizia chiunque si sia reso colpevole del tradimento di Ariodante e quindi della sua morte. Scena 6. Polinesso e Lurcanio guidano la folla davanti al Re; Lurcanio denuncia Ginevra e chiede la sua morte. Il Re, inorridito nel trovare la propria figlia colpevole di tale accusa, è costretto ad applicare un’antica legge secondo la quale una donna di cui sia stata dimostrata la lascivia deve essere condannata a morire sul rogo. Scena 1. Vafrino, servitore di Ariodante, si aggira sconsolato lungo la spiaggia, senza riuscire a trovare il corpo del suo padrone. Sente le urla di una donna in difficoltà e riesce a salvarla dalle minacce di due assassini. Si tratta di Dalinda, che gli confessa di essere stata vittima di uno spietato inganno e promette di rivelargli tutto. Scena 2. Un fitto bosco intorno a un eremo. Entra Ariodante, sfuggito alla morte, in preda alla disperazione. I suoi pensieri vengono interrotti dall’apparizione degli eremiti i quali gli rivelano che Ginevra è stata condannata a morte e sarà giustiziata quel giorno stesso, a meno che non si presenti un campione a difenderla. Sebbene sia convinto della colpevolezza della donna, Ariodante l’ama ancora e decide di andare a difenderla. Gli eremiti approvano la sua decisione e lo sollecitano ad affrettarsi. Scena 3. Sconsolato, il Re piange la prossima perdita della figlia e rimprovera Lurcanio di ripagare in questo modo la gentilezza ricevuta. Lurcanio replica che il suo primo dovere è quello di vendicare il fratello. Scena 4. Ginevra dichiara al padre che non ha paura di morire, perché nella morte sarà riunita con l’amato Ariodante. Però teme l’infamia che sarà legata al suo nome se viene pubblicamente bruciata sul rogo e supplica di avere una spada o un veleno per morire da sola in modo più appropriato. Il Re è profondamente scosso, ma non si impegna in nessun modo. Scena 5. Al calare del sole compare Polinesso, che si rallegra segretamente del suo prossimo ruolo di maestro delle cerimonie al rogo di Ginevra, ma finge di essere solidale con il Re nel suo dolore. Quando gli viene chiesto se è disposto a difendere Ginevra, prevedibilmente rifiuta, dichiarandosi convinto che la legge debba fare il suo corso. Lurcanio sollecita l’esecuzione di Ginevra, ma a questo punto si presenta un cavaliere con una corazza nera e la visiera abbassata. Dichiara di essere il campione di Ginevra e scaglia a terra il proprio guanto; Lurcanio, in qualità di accusatore di Ginevra, lo raccoglie. Nonostante Ginevra lo supplichi di rivelarle la propria identità, il cavaliere sconosciuto dichiara che lo farà solo dopo il combattimento. Nel rispetto della tradizione, viene lasciato solo con Ginevra fino al momento del duello. Ginevra gli esprime la propria gratitudine, ma lo supplica di non costringerla ad essere sua in caso di vittoria; non potrà mai amare nessuno se non Ariodante, che ha ormai perduto. Il giovane, da parte sua, si dichiara disposto a morire per lei, ma ammette che non ha speranza di vittoria, dal momento che “solo il campione della giustizia vincerà”. Ginevra l’assicura di essere dalla parte del giusto e ribadisce la propria innocenza. Colpito dalla sua fermezza e commosso dalle sue suppliche, il cavaliere sta per rivelarsi, ma il suono delle trombe lo chiama al combattimento e si allontana in fretta. Scena 6. Nella piazza grande della città si trova una zona recintata per il combattimento e, da un lato, una pira funeraria. Ginevra arma il suo cavaliere, che entra nella zona del combattimento con Lurcanio. Ma prima che inizi il duello entrano Vafrino e Dalinda. La donna confessa che si è lasciata sedurre e che, in cambio, Polinesso l’ha consegnata a due servi per farla uccidere. Polinesso nega e si dichiara disposto a difendere il proprio nome contro tutti. La sua sfida è raccolta dal cavaliere sconosciuto. I due combattono e Polinesso è disarmato; non gli resta che confessare o morire. Polinesso confessa apertamente e con rimorso la sua colpa. Adesso che la sua innocenza è manifesta a tutti, Ginevra può finalmente abbracciare il padre. Chiede il permesso di finire i propri giorni in solitudine, per piangere il suo Ariodante, ma a questo punto il cavaliere sconosciuto alza la visiera e, tra la sorpresa e la gioia di tutti, si rivela: è Ariodante, che può finalmente unirsi a Ginevra. L’opera si chiude tra i festeggiamenti e la gioia generale. Le roi fait part de la bonne nouvelle à sa fille, Ginevra, et lui enjoint de préparer la couronne de lauriers qui ornera le front du chevalier victorieux ; cet ordre lui est d’autant plus doux qu’elle est profondément éprise d’Ariodante. Dalinda, sa confidente, la prévient que le roi, son père, ne lui permettra jamais d’épouser un chevalier étranger et sans famille. Il vaudrait mieux accepter une alliance avec Polinesso, duc d’Albany et chef suprême de l’armée écossaise, ajoute Dalinda. Ginevra lui répond que le déplaisir que lui cause Polinesso n’a d’égal que l’amour qu’elle porte à Ariodante. Sa réaction ne peut qu’enchanter Dalinda, elle-même éprise de Polinesso, qui a fait cette suggestion à Ginevra à la demande de celui-ci. Scène 2. Dalinda rencontre Polinesso dans les jardins du palais pour lui faire part des sentiments de Ginevra. Polinesso, poussé par l’orgueil, le violent désir qu’il éprouve pour Ginevra et un sentiment de haine envers Ariodante, cache sa rage et feint le calme. Il dit vouloir renouer avec Dalinda, et lui déclare qu’il l’épousera le soir-même. Pour faciliter leurs retrouvailles, il lui demande de lui lancer une échelle de corde du balcon de Ginevra. Il la prie, par ailleurs, de se vêtir et de se coiffer comme le ferait la fille du roi. Surprise et mystifiée par ces « folles requêtes », Dalinda accède à ses prières. Scène 3. Le roi et ses courtisans célèbrent ensemble la victoire d’Ariodante. Celui-ci fait une entrée triomphale, s’agenouille devant le roi et lui remet le butin de guerre. Ginevra dépose une couronne de lauriers sur son front tandis que Polinesso, qui assiste à la scène, se consume de jalousie. Lurcanio reproche à Dalinda de ne pas lui rendre l’amour qu’il lui porte. Elle lui répond que son cœur était pris avant même qu’il n’arrive en Écosse mais refuse de lui révéler le nom de l’heureux élu. Scène 4. Polinesso accoste Ariodante dans les jardins du palais et lui tient des propos insinuants sur la conduite de Ginevra. Il va jusqu’à prétendre qu’il est l’amant de la jeune femme et invite Ariodante à se trouver sous son balcon le soir même pour s’en convaincre. Incrédule et indigné, Ariodante ne peut qu’accepter et déclare à Polinesso que si c’est la vérité, il lui abandonnera Ginevra. Scène 5. Un quartier de la ville partiellement en ruines sur lequel donnent les appartements de Ginevra ; à l’arrière-plan un pont domine la rivière. Ariodante, fidèle au rendez-vous, est rejoint par son frère Lurcanio. Ensemble ils se cachent parmi les voûtes en ruines au moment où paraît Polinesso. Celui-ci, conscient de la présence d’Ariodante, se réjouit à l’avance de sa déconfiture. Dalinda apparaît comme prévu au balcon et déroule une échelle à laquelle grimpe Polinesso. Ariodante et Lurcanio sont, l’un et l’autre, convaincus d’avoir vu Ginevra accueillir son amant. Lurcanio parvient à désarmer son frère, qui veut se donner la mort. Désespéré, Ariodante se précipite alors vers le pont et se jette dans la rivière. Aux cris désemparés de Lurcanio, la population accourt – suivie par Polinesso qui a l’hypocrisie de prétendre que ce rassemblement ne peut être qu’une émeute contre le monarque. Lorsqu’on lui explique les circonstances du suicide d’Ariodante, il invite la foule à le suivre jusque chez le roi pour exiger que soit punie celle qui a causé la mort d’Ariodante en le trahissant. Scène 6. Polinesso, Lurcanio et la foule se présentent devant le roi. Lurcanio dénonce Ginevra et demande sa mort. Le roi, horrifié de voir sa fille accusée d’une telle infamie, est obligé d’appliquer une ancienne loi condamnant au bûcher toute femme qui a attenté à la chasteté. Scène 1. Incapable de retrouver le corps de son maître, l’écuyer d’Ariodante, Vafrino, se lamente en arpentant la rive. Alerté par les cris d’une femme en détresse, il arrache Dalinda aux mains de soi-disants assassins. Celle-ci lui confie alors qu’elle a été victime d’une cruelle machination qu’elle promet de lui révéler entièrement. Scène 2. Un bois touffu autour du temple ou de la chapelle où se réunissent certains ermites. Ariodante, qui a échappé à la mort, fait son entrée dans un état de profond accablement. Le sombre cours de ses pensées est interrompu par l’arrivée des ermites. Ils lui apprennent que Ginevra a été condamnée à mort et qu’elle mourra le jour même si aucun chevalier ne se présente pour sauver son honneur. Bien que persuadé de sa culpabilité, Ariodante ne l’en aime pas moins et décide de lui porter secours. Applaudissant sa décision, les ermites lui enjoignent de se presser. Scène 3. Le roi, inconsolable et désespéré à l’idée de perdre sa fille, accuse Lurcanio d’ingratitude. Celui-ci lui répond que venger son frère est son premier devoir. Scène 4. Ginevra assure à son père que mourir ne lui fait pas peur car seule la mort l’unira à Ariodante, son bien-aimé. Toutefois l’infamie, dont son nom restera entaché si elle est brûlée en public, l’effraie et la révolte. Aussi supplie-t-elle son père de lui donner l’épée ou le poison qui lui permettront de mourir dignement et loin des yeux de la foule. Bouleversé, le roi reste muet. Scène 5. Au crépuscule, Polinesso s’apprête à jouer le rôle de maître de cérémonie lors de la mise au bûcher de Ginevra et s’en réjouit secrètement. Il prétend néanmoins partager la douleur du roi. Lorsqu’on lui demande s’il serait prêt à défendre l’honneur de Ginevra, il refuse bien sûr en se déclarant convaincu que la loi doit suivre son cours. Lurcanio est impatient de voir Ginevra mise au bûcher. C’est alors que se présente un chevalier revêtu d’une armure noire et d’un casque dont la visière est abaissée. Il se dit le champion de Ginevra et jette son gant aux pieds de l’accusateur de Ginevra, Lurcanio, qui le relève. A Ginevra qui le supplie de lui révéler son identité, le chevalier répond qu’elle ne la connaîtra qu’à l’issue du combat. Conformément à la coutume, il reste seul avec Ginevra jusque là. Ginevra lui exprime sa gratitude mais lui demande de ne pas insister pour qu’elle l’épouse s’il sort vainqueur du combat. Personne, dit-elle, ne pourra remplacer dans son cœur l’Ariodante qu’elle a perdu. Le chevalier lui déclare qu’il est prêt à mourir pour elle, mais qu’il n’a guère d’espoir de vaincre dans la mesure où « seul le défenseur de la justice peut être assuré de la victoire ». Ginevra lui assure qu’il va combattre pour la justice et qu’elle est innocente. Impressionné par sa fermeté et ému par ses supplications, le chevalier s’apprête à lui révéler son identité. C’est alors que retentissent les trompettes annonçant le début du combat. Il garde le silence et sort. Scène 6. La place principale de la ville, où est aménagée une aire de combat entourée d’une palissade avec, sur le côté, un bûcher. Ginevra arme son défenseur qui se retrouve face à Lurcanio dans l’aire de combat. Ils sont sur le point de s’affronter lorsque Vafrino et Dalinda se présentent. Celle-ci confesse qu’elle s’est laissé séduire par Polinesso, qui a ensuite ordonné à deux de ses hommes de l’assassiner. Polinesso nie et se dit prêt à défendre son honneur. Le chevalier inconnu relève le défi, se bat contre Polinesso et le désarme. Obligé de choisir entre la confession ou la mort, et assailli par les remords, Polinesso se reconnaît coupable en tout. Ginevra, dont l’innocence est désormais prouvée, embrasse son père. Elle lui demande la permission de finir ses jours dans quelque retraite solitaire où elle pourra pleurer Ariodante. C’est le moment que choisit le chevalier inconnu pour relever sa visière, et chacun a la surprise et la joie de reconnaître en lui Ariodante. Il se trouve ainsi réuni à Ginevra, et l’opéra s’achève dans une atmosphère de réjouissances et de célébrations.